Just a quick post as I recover from the massive array of notes taken during Mondovino 2013. 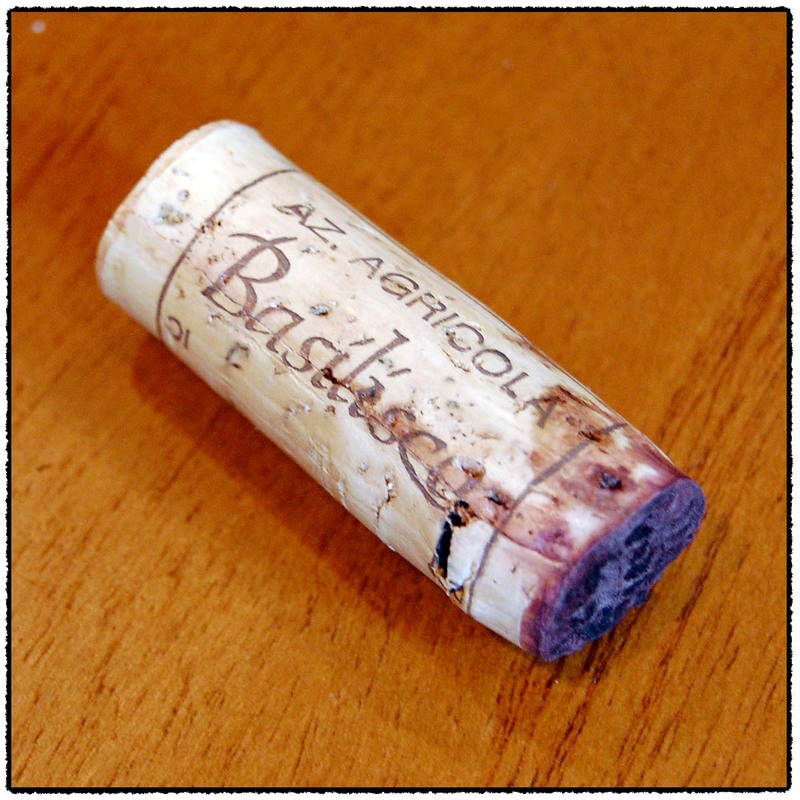 I grabbed this bottle of Basilisco because it was 15 years old and the wines I have tasted from Aglianico del Vulture have been capable of aging. 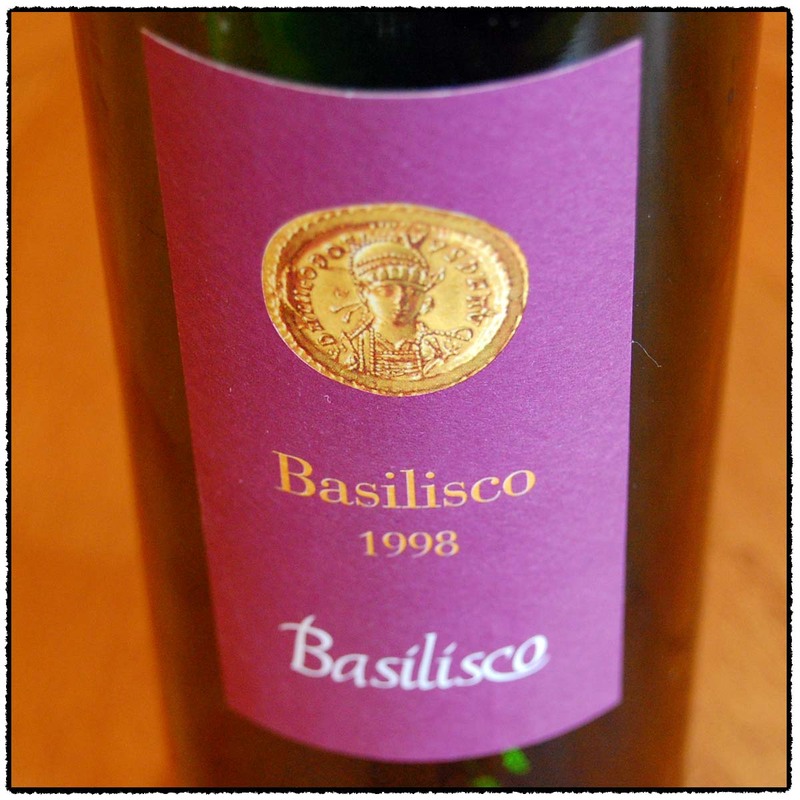 Though Basilisco was only founded in 1992 the winery dates back to the fifteenth century when the cellar was dug out of the volcanic tufa. Two wines are produced from the 20 hectares of vines on the hillsides of Mount Vulture where the vines are located between 300 and 500 meters in elevation. This wine is young, surprisingly so. It was a bit robust at first but with several hours of air it became quite good and expressed its future potential. I recommend you buy a few bottles for the cellar. Many thanks to John Fusciello and Julia Schwende for helping me out. This wine was purchased at MacArthur Beverages. Imported by Vinifera Imports. This wine is 100% Aglianico which was fermented in stainless steel tanks then aged for 12-18 months in used French oak barriques. Alcohol 14.5%. The color was medium garnet. The medium strength nose was pungent with roast earth and dusty, tart berries. In the mouth there were robust flavors on the front of the tongue with tart red fruit, some wood box, and metallic minerals. With air the flavors became blacker and seemed chiseled of stone. Medium textured tannins came out in the drier finish, along with hints of tobacco, orange peel, and vanilla. ***(*) 2018-2028. Just a quick post for today but do give heed to these wines. Azienda Agricola Eubea is a new producer to me and I must admit I am now curious. The nose was incredibly engaging, if you are a frequent reader of my notes you know I do not typically string descriptors together. In comparison the flavors are tight. You could buy a bottle simply to smell it but I would be tempted to give it some time in the cellar to loosen up. The Paternoster is enjoyable as well with just a few hours of air. It is a more refined example with an attractive wood box component. These wines are available at MacArthur Beverages. Imported by David Vincent Selections. This wine is 100% Aglianico sourced from 40-60 year old vines. Alcohol 13%. The light to medium strength nose is of scented red fruit, nutmeg, Thanksgiving spices, leather, and tobacco. Wow! In the mouth there is red fruit and leather flavors with medium coarse tannins from the start. There is tart black fruit and acidity, concentration in the finish, and drier flavors. Despite the interesting nose this remained tight in the mouth. Cellar a few years. **(*) 2015-2022. Imported by Banville & Jones Wine Merchants. This wine is 100% Aglianico sourced from vines at 450-600 meters. It was aged in 80% large Slavonian oak barrels and 20% French barriques. Alcohol 13.5%. The color is a medium cranberry ruby. The light nose is of red fruit and wood box. In the mouth there is focused black and red fruit with acidity on the sides of the tongue. The focused fruit continues and is more refined than the Eubea. This is a nice wine that is evocative of Bordeaux. *** 2014-2022. When I found out that MacArthurs was out of the 2007 Bisceglia, Terre di Vulcano I promptly contacted Tim and found out that they had two vintage of the Gudarra in stock. 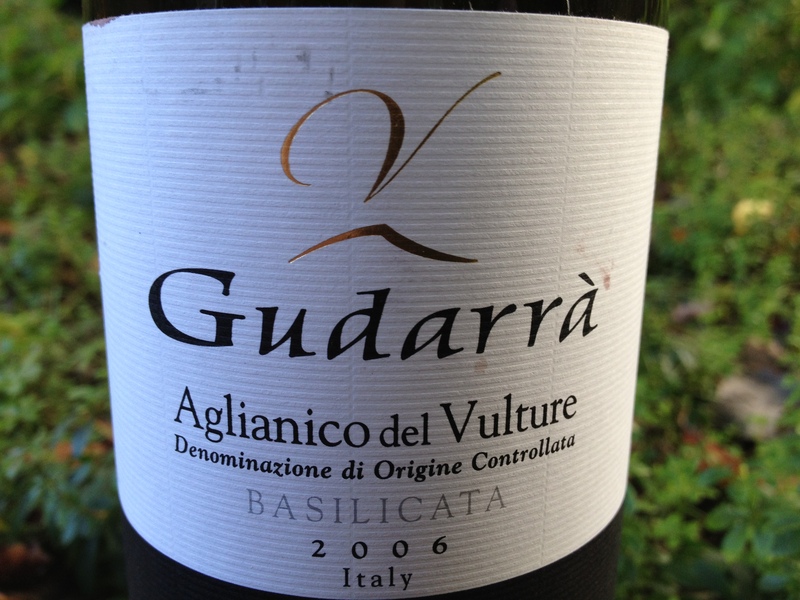 The Gudarra is 100% Aglianico sourced from the Foragine and Le Cortiglie vineyards located at 1200 feet of elevation. The vineyard was planted in 2001 and the fruit is typically harvested in late October. It is fermented in stainless steel then aged for 12 months in 100% new French barriques. 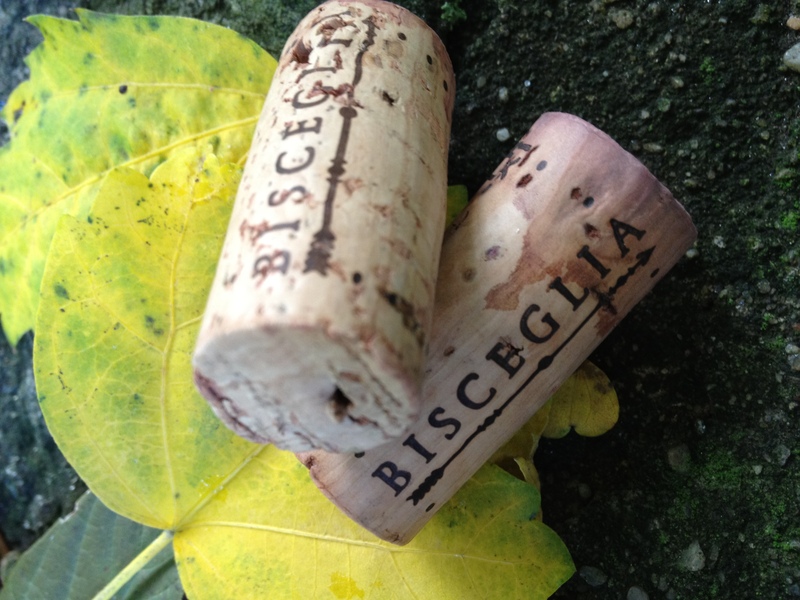 These two vintages of Bisceglia are imported by Winebow. The 2006 costs $19 and the 2007 costs $22 at MacArthurs. While these are not the stunning value of the Terre di Vulcano, they are excellent wines worthy of trying and certainly worth the price. I would recommend drinking the Terre di Vulcano while these vintages of Gudarra age. This wine has dark red fruit flavors, while related to the prune notes of the 2007, lean more towards black tea and dried herbs. This is less fruit driven, instead offering up a drier, complex blend of herbs that are interesting to ponder. This is approachable now but the flavors are controlled so I would either decant it ahead of time or age it to allow more expansion. *** Now-2017. This wine is riper than the 2006 with Jenn finding strong flavors of good prune. In the mouth the dark, ripe fruit is gritty and presents a lot of up-front texture. I found interesting notes of mushrooms and stones. This flavorful wine leaves the impression of perfect balance between fruit, tannins, and acidity. While it is enjoyable now, I suspect this vintage will develop for a few more years before hitting its stride and lasting for some time. **(*) 2014-2019. 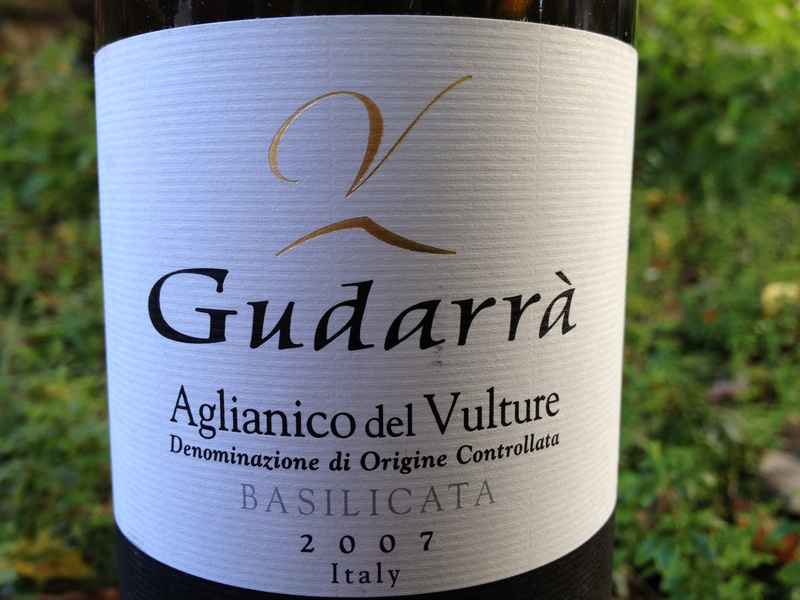 Aglianico del Vulture is a DOC located around Monte Vulture which is located in the northern portion of Basilicata. Basilicata is the southern region located between the heel of Puglia and the toe of Campania. 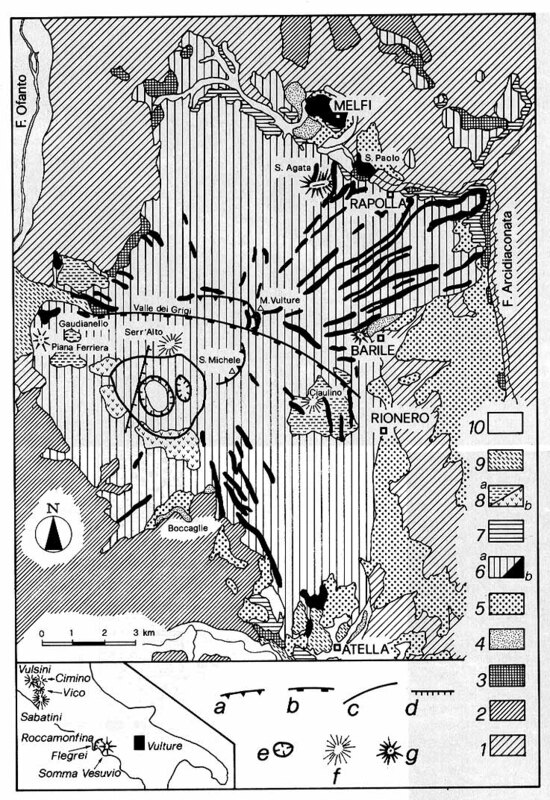 The vineyards lie on volcanic soils at high altitudes of 1500-2200 feet. As a result of the cool temperature the Aglianico is often harvested in October and November. The Bisceglia is imported by Winebow and was recently available at MacArthurs for $11. There was a stack of this wine quietly sitting at the back of MacArthur’s but now it is gone. It is currently available at Calvert Woodley for $14. This is a wine that Jenn and I have been drinking throughout the summer. It was an interesting wine that developed in the glass, so drinkable, and incredibly affordable that I only wrote down my tasting notes last week! At $11 it was a mind-blowing deal but at $14 it is still a good value wine. 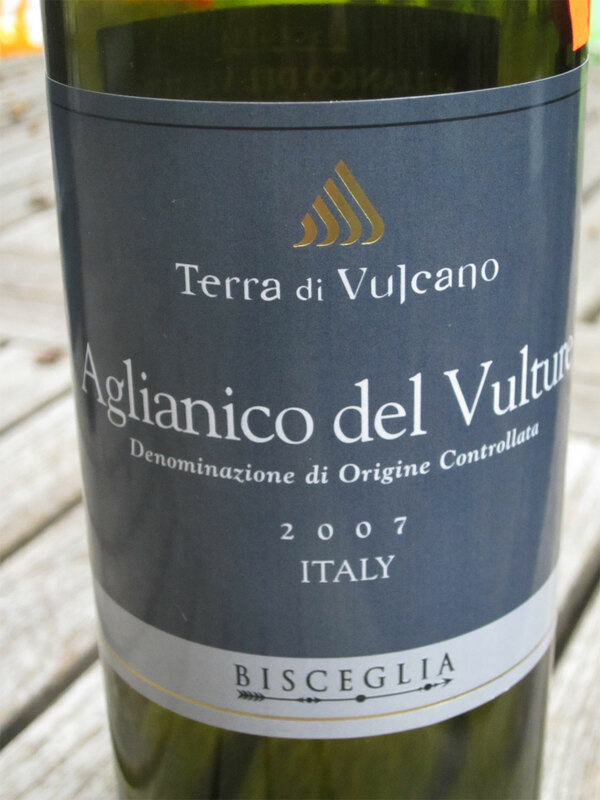 I really enjoy the volcanic wines of Italy and recommend that you give them a try. *** Now-2017. This wine is 100% Aglianico sourced from the Toppo di Viola vineyard. This vineyard is located at 1250 feet on volcanic, limestone, clay, and loam soils and was recently planted in 2001. The grapes were fermented then aged in stainless steel. There is a dark nose of cherries. In the mouth this medium to full-bodied wine has textured fruit, minerals, and good power. The tart red fruit is supported by salivating acidity and textured tannins that coat the inside of the mouth. While this wine is quite open and easy to drink due to its forwardness, it will clearly last for years to come. From time to time I ask my local wine merchant for Italian recommendations and I’m usually not disappointed. The Cavallotto was clearly a step up in quality (and price) from the Giochi and Venosa. I imagine this will smell great once it matures. For now you must inhale deeply. The Giochi delivered well straight from the bottle and wouldn’t get lost in a crowd of budget wines. The Venosa took some time to get going but maintained is pervasive smoked tea leaf aromas and flavors. It reminded me of tea smoked duck (the process not the duck), perhaps this is tobacco to others. Jenn and I preferred the Giochi over the Venosa but then Jenn took a liking to the Venosa. This wine is made from Cabernet Sauvignon and Barbera. It was made in steel and aged for 12 months in French oak barrels. It is a very dark, deep purple ruby. There is a light nose of dark fruit and perhaps fresh green veggies. In the mouth there are tart berries, that start off tight but slowly round out with air. There medium to full bodied wine has an inky aftertaste, with very fine but thorough tannins. A different type of wine than I am used to but enjoyable and well done at this price point. This wine is 100% Aglianico that is 15-30 years of age. It is aged for 12-15 months in 5-10 year old Slovenian oak casks. A little light in color and more garnet than the Giochi. A light to medium nose of smoked tea leaf and tar. In the mouth there are some blue fruits with a pervasive smoked tea leaf flavor. The fruit sweetens after several hours of air. It is medium to light-bodied with fine, assertive tannins. 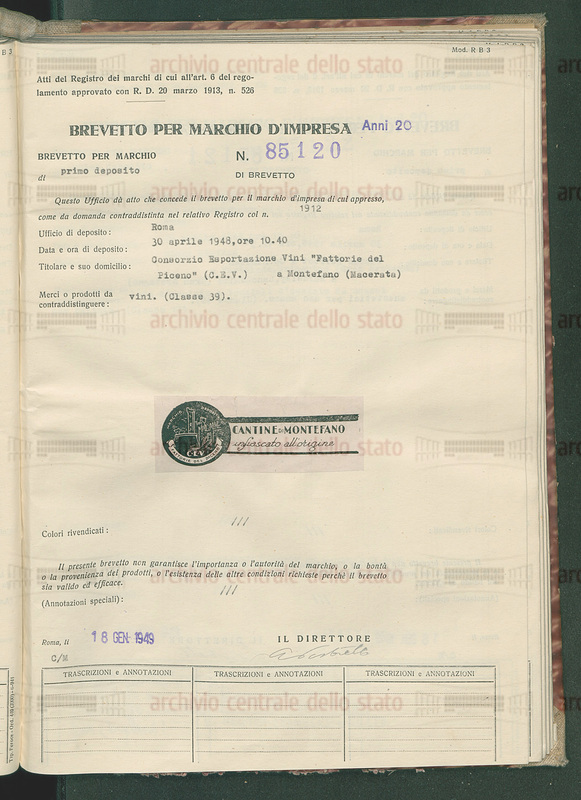 The Cavallotto family has been growing Nebbiolo since 1929 and bottling their own wine since 1948. This 100% Nebbiolo wine is mature in oak casks. There is a very subtle nose of beautiful, dark red fruit. In the mouth there is dark fruit with immediately noticeable acidity, combined with tea/tobacco flavors and a good amount of ultrafine tannins. This is clearly a young wine but is drinking very well. The tannins are very nice considering it spent 18-24 months in oak.